Every June, students all over the country don their caps and gowns for graduation. Whether it's from high school, college or graduate school, most people could easily count their own graduations on one hand. But not 71-year-old Michael Nicholson of Kalamazoo, Mich. Nicholson has earned 29 degrees and is now pursuing his 30th. "I just stayed in school and took menial jobs to pay for the education and just made a point of getting more degrees and eventually I retired so that I could go full-time to school," Nicholson told ABCNews.com. "It's stimulation to go to the class, look at the material that's required and meet the teacher and students. It makes life interesting for me," he said. "Otherwise, things would be pretty dull." Nicholson has one bachelor's degree, two associate's degrees, 22 master's degrees, three specialist degrees and one doctoral degree. Most of the degrees are related to education such as educational leadership, library science and school psychology, but other degrees include home economics, health education and law enforcement. Nicholson is currently working on a master's degree in criminal justice. "I would like to get to 33 or 34. I'm almost there," he said. "When I complete that, I'll feel like I've completed my basic education. After that, if I'm still alive -- that would take me to 80 or 81 -- I would then be free to pursue any type of degree." Nicholson's early interest in education came from the encouragement of his parents, who wanted him to be well-educated. His Canadian father was forced to drop out of school after the third grade to work and his mother graduated from high school. "We were motivated to continue with our educations and go as far as we could go," he said of himself and his siblings. "She [his mother] wanted something better for us than simply working at a factory, so she kept doing the necessary for us to continue." Nicholson's first degree was a bachelor's in religious education from William Tyndale College in Michigan in 1963. Five degrees later, he was pursuing his doctorate in education from Western Michigan University in 1978. 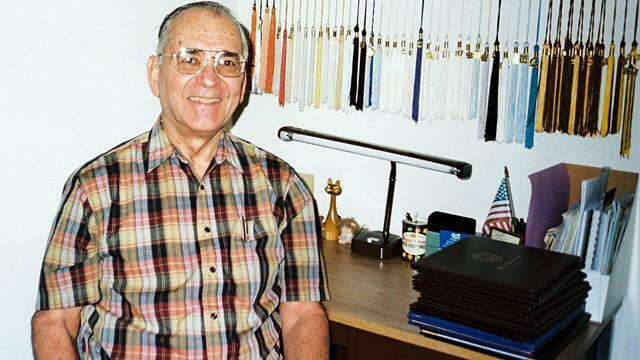 While pursuing the doctorate, he met Western Michigan University Professor Tom Carey when Nicholson was working as a parking lot attendant writing tickets for the university. He wrote Carey three tickets in one day and the two have now known each other for 35 years. "I've had 18,000 students in class and I've never heard of anybody like this," Carey told ABCNews.com. "He's the ultimate life-long learner. I marvel at his tenacity to go to school." Nicholson has earned all of his degrees; none of them have been honorary or awarded degrees. Though Carey was never Nicholson's professor, the two meet at least once a year for Nicholson to give Carey an updated resume, which he shows students in his classes. "He's intrinsically motivated. It's unique, but it almost sounds bizarre," Carey said. "Some people collect animals and he collects tassels." And collect tassels he does. Nicholson has been to 28 of his 29 graduation ceremonies. What does he enjoy about the graduation ceremonies? "Just the pomp and circumstance. ... I could do without the speeches," he said with a laugh. "Eventually, it became getting as many as I could," he said. "There's the excitement of graduation, but the overall objective was to get the degree." He has earned degrees from a dozen schools in places including Michigan, Texas, Indiana and Canada, and he always goes to class. "I would not take an Internet class. That's far too difficult," Nicholson said. "I'm not one of those all-A students." He still works on a typewriter and his wife Sharon Nicholson helps him type up his assignments. His wife is highly educated in her own right, with seven degrees of her own. "She helps me with my homework all the time," he said. "I cannot function on a computer, so she has to do it." When asked what advice he would give to recent graduates, Nicholson paused before saying, "Don't quit too soon. Keep up with your aspirations. A lot of people tend to throw in the towel and have to come back to it later. Don't give up on your aspirations too soon." And the admittedly competitive Nicholson has no plans to give up on his own aspirations, hinting that he has his eye on a few more degrees in the next few years. "He likes going to school and doesn't want responsibility," Carey said. "This is what Mike lives for. He's about 70 and he's not going to stop. It wouldn't surprise me if at one point he tried law school or something else."